Trench warfare was unseccessful, 10% of all soldiers in the trenches would die and 50% of all soldiers would be wounded. Very large groups of diggers would be brought out to dig these trenches. At some places the distance between enemy trenches were only 30 yards. These trenches were usaually dug at 6 to 8 feet deep and had barbed wire. 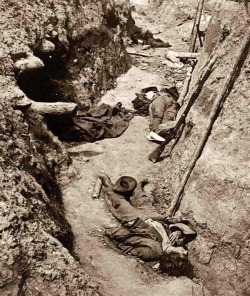 The trench idea was brought out to the battlefield for the belief that soldiers could release heavy fire at the enemies without exposing their heads and the rest of their body. In the trenches it was a very tight place, poor hygiene and sanitary conditions played a role in disease and a slow death for many soldiers. Soldiers had to deal with terrible weather conditions, sometimes freezing cold temperatures and also a very high psychological pressure. Some major battles that took place were the battle of Ypres, First battle of Marne, Second battle of Marne, and the battle of caporatto. Beginning of 1914• January 8: Germany forms a southern army to support the faltering Austrians. • January 19: First German Zeppelin raid on British mainland. • January 31: The first use of poison gas in WW1, by Germany at Bolimow in Poland. • February 4: Germany declares submarine blockade of Britain, with all approaching ships considered targets. This is the start of Unrestricted Submarine Warfare. • March 11: The Reprisals Order, in which Britain banned all 'neutral' parties from trading with Germany. • March 18: Allied ships attempt to bombard areas of the Dardanelles, but their failure causes the development of an invasion plan. • April 22 - May 25: Second Battle of Ypres (WF); BEF casualties are triple those of Germans. • April 26: The Treaty of London is signed, in which Italy joins the Entente. • April 22: Poison Gas is first used on the Western Front, in a German attack on Canadian troops at Ypres. • May 2-13: Battle of Gorlice-Tarnow, in which the Germans push Russia back. • May 7: The Lusitania is sunk by a German submarine; casualties include 124 Americans passengers. • July 13-15: The German 'Triple Offensive' begins, aiming to destroy the Russian army. • July 22: 'The Great Retreat' (2) is ordered - Russian forces pull back out of Poland (currently part of Russia), taking machinery and equipment with them. • September 1: After American outrage, Germany officially stops sinking passenger vessels without warning. • September 5: Tsar Nicholas II makes himself Russian Commander-in-Chief. • September 12: After the failure of the Austrian 'Black Yellow' offensive (EF), Germany takes over ultimate control of Austro-Hungarian forces. • November 23: German, Austro-Hungarian and Bulgarian forces push the Serbian army into exile; Serbia falls. • December 10: The Allies begin slowly withdrawing from Gallipoli; they complete by January 9 1916. • December 18: Douglas Haig appointed British Commander-in-Chief; he replaces John French. • December 20th: In 'The Falkenhayn Memorandum', the Central Powers propose to 'bleed the French White' through a war of attrition. My opinion on the trench warfare method of battle is that it was not a very good plan, it was very dangerous, and it did not benefit a countries army or position in anyway. In World War One the battles that took place in the trenches killed many soldiers and didn't really give either side an edge against the other because of the amount of soldiers each side lost. Fifty percent of soldiers stationed at a trench died from a disease or weather related condition and ten percent of the stationed soldiers were killed by a bullet. Those statistics are not exactly in favor of the soldiers putting their lives on the line for their country or getting them closer to a victory when the ones that died in these trench battles died for nothing most of the time. All the work that was put into making these massive trenches was a time consuming process. Some trenches in some countries totaled 400 miles. These trenches ranged from 6-8 feet deep, and 10-18 feet across, and the duggouts underground sometimes were big enough to hold near 50 soldiers at a time. Also, the cielings were 15 feet beneath the surface making them safe from any kind of bomb in that time period. All the hours put in to making these trenches were useless when the trenches were often flooded with water and held a variety of diseases. Daily there were on average nearly 200 soldiers killed and some peaked much higher than that. Like today, the majority of the soldiers had families at home and they died and put their families through hard times when they could have fought somewhere where soldiers lived. The trench method of war has only done one thing and that was to show us not to do it ever again. In today's world we don't use trenches at all. This is for two reasons. One being that technology in today's world doesn't require us to send in soldiers so close to the enemy. And two is that it wasn't a good method and wasn't efficient for any army at all. In today's wars there isn't as much close range battle. By this i mean, a line of 500 or so soldiers standing 50 yards away from the enemy line of soldiers with the same amount doesn't occur. War in today's world can be fought from miles upon miles away and even using standard gun fire. We can do the same damage from almost 100 yards away with a less amount of soldiers. So this method of war did not stay around for very long and it is in the best interests of the soldiers that it didn't. My position regarding the trench method is completely against it and I hope we never decide to use it in today's wars.